Cut back unnecessary watering -- consider letting your lawn go dormant. Water plants deeply, but infrequently, early in the day or late at night. Mulching planting beds also helps with reducing watering. Visit the Waterwise Garden at the Bellevue Botanical Gardens, where residents can learn how they can save water in their own gardens. Wash only full loads of laundry in washing machines or dishes in dishwashers. Turn the water off. Avoid letting the faucet run when shaving, brushing teeth, and washing. Take shorter showers -- even cutting your shower by 2-3 minutes adds up. Wash your car infrequently, and when you do take it to a commercial wash where the water is recycled. Order and install free water-saving items, including low-flow shower heads and leak detection kits, from Bellevue's water provider -- Cascade Water Alliance. Handy graphic--did we skip over Advisory, or did I miss it? Sadly, the only item on that list that my family isn't already doing is the "Take shorter showers" bullet point. And, apart from my husband in the morning, most of us are pretty brief going about our showering business. Sweet and crisp, rather like the yummy ones the Market used to enjoy from Rockridge Orchards. In addition to Asian pears, my sister and her hub planted a branch of the neighbor's fig tree and now reap the benefits. Figs are an ideal fruit, and every time I fork out $8 for a jar of fig jam, I wish they grew more abundantly in Washington. After all, what other fruit can be chopped up coarsely, mixed with sugar, pectin, and lemon juice, left to stew for an hour, and then become easy freezer jam? No peeling, so seeding, no nothing. I entreated my sister to make a batch of fig freezer jam with her bumper crop, but with that California take-it-for-grantedness she only said, "Maybe next year." Next year? Next year the drought may have reached beyond epic proportions, or whatever you would call a drought that's already designated as the worst in at least 150 years. This horrible drought doesn't even begin to approach what scientists call "Megadroughts," which last decades. So the figs might not be there next year or ten years from now, which makes me glad I enjoyed them now. Washington might (should?) have longer, but we may all want to be looking toward snapping up real estate along a river in Northern British Columbia as the globe warms. In the meantime, enjoy those figs. If you're anything like me, with the start of school and kids' sports, Thursday afternoons and Saturdays might have become crazy-time for you. Gone are my leisurely wanderings of the Market. Now I'm a Woman on a Mission: get everything on my list before I take off to arrange carpools/run carpools/attend a kid's swim meet/get to my book club, and then do some more running carpools for good measure. 1. FRESH, RIPE TOMATOES. We're headed back into the months of gassed, green, supermarket baseballs that substitute for the real thing, so get the real thing now. We've been enjoying homemade Caprese salad, homemade tomato soup, homemade tomato sauce, homemade pico de gallo. If you have a food mill to remove tomato seeds and skins, there is nothing easier than tomato soup or sauce. You just cook until the quartered tomatoes break down, run it through the food mill, and then let it simmer until it achieves the desired consistency. Sometimes I add some sauteed onions and garlic, and other times it's just tomatoes, salt, and pepper! 1.5 MARKET CHEESE. If you're into Caprese salads (and who isn't? 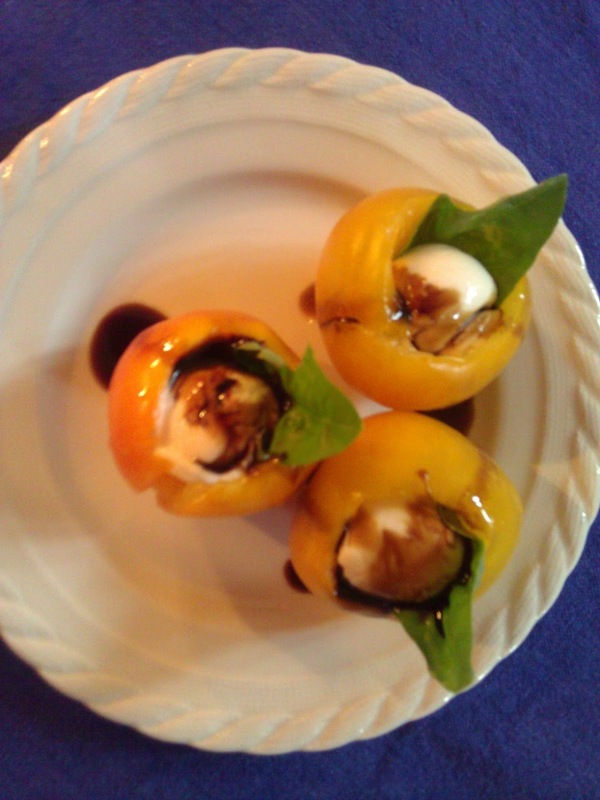 ), you don't have to limit yourself to fresh mozzarella, although Samish Bay does carry that. In my zeal to avoid unnecessary plastic containers, I've been experimenting with other cheeses. A quarter baby wheel of their Queso Fresco works just as well, as would the Ladysmith. And just about every cheese at the Market would be awesome in a grilled cheese sandwich, to go with that homemade tomato soup. Roast 'em, grill 'em, saute 'em. It's all good. If I chop them small enough, I can hide them in spaghetti sauce and soup. 4. MELONS. Meltingly ripe, juicy and sweet! 5. A SNACK FOR THE ROAD. If you see me at the Market, I usually have my ten-year-old in tow. She's my pack mule, for which I pay her with one Market snack. She's done hum baos from The Box, cookies and hand pies from our marvelous bakers, granitas from Rockridge, hand-muddled drinks from Deru, raspberries and blueberries, and plenty of ice cream from Half Pint. I "tax" all her snacks, of course, and can vouch for their deliciousness. Last week's orange-chocolate-chip ice cream from Half Pint was out of this world. But don't take my word for it--try it yourself! What's on your can't-miss list this week? Eggs? Bacon? Salmon? Pasta? Veraci pizza? The Market has it all. If the back-to-school rush has prevented you from getting to the Market recently, don't miss this week! Just four Thursdays remain (the Saturday Market goes until right before Thanksgiving, thank heavens), and the Market is chock full of goodies. In a nutshell--yum! We devoured them and were back for more on Saturday. The skin is slightly tart, like a plum's, but the flesh is sweet through and through. Makes my mouth water just to write this paragraph. And you can eat the skins because Collins doesn't spray their fruit. I love how so many of our fruit vendors price to mix and match. It encourages us to try new varieties. Wade at Rockridge treated the nine-year-old and me to a "flight" of Asian pears, so we could compare and contrast. I loved them all, especially the 20th Century. No--it was the Chojuro--no--the Kikisui! Oh, drat, I'll have to go back and try again. The nine-year-old turned out to have the more discerning palate. When she bit into the Hosui, she said it tasted like the last two she had tried, put together. Wade said that, indeed, that was exactly what it was--a cross between the Kikisui and the Chojuro. May have gotten those names wrong, too. You just try taking notes when your hands are full of Asian pears! Anyhow, great size for the lunchbox. Fruit vendors weren't the only ones enjoying the bounty of the season. At Crepes they were serving up two specials: Blueberry Salmon with Balsamic Reduction and Manchego Cheese with Prosciutto and Blueberries. Oh my word. And the jam makers are going to town. Those would be Appaloosa beans (like the horses) in the front, and Dragon's Tongues in the back. Almost too lovely to cook, but if you do, remember that fresh beans require only a fraction of the time needed for dry beans! For those of you who have hung in this long, hoping for some meat to this post, I offer up the following recipe we recently devoured. All ingredients from the Market have been marked with an asterisk(*). Slice the cabbage and/or bok choy (I used a mix) crosswise in thick strips. Set aside. In a bowl, mix ground pork through pepper, adding enough cornstarch at the end to hold it together in meatballs. (I threw in 2 of the Tbsp and then added the 3rd.) Shape into four giant meatballs or eight smaller ones. Heat 2 Tbsp cooking oil in skillet on med-hi. When hot, add meatballs. Brown for 3-5 minutes on one side and then rotate to brown another side. Meanwhile, heat chicken broth and 2 more Tbsp soy sauce in a large skillet or saucepan with cover. When boiling, add meatballs. Reduce heat and simmer, covered, for 10 minutes. Add in cabbage/bok choy. Cover again and simmer another 15 minutes. This is a soupy dish to serve over rice or noodles. Or you can make a cornstarch-and-water slurry, add it to the broth and thicken into a sauce. Everyone chowed this down, and I think the next time I make it, I'll double the cabbage because it was so tasty! Yes, the weatherman promises, the heat is here--at least through the end of the week. As if the blessed 80s weren't warm enough, my family is headed over the mountains to "enjoy" mid- to high 90s, coming back next Friday when the Tri-Cities will supposedly zoom over 100F. The downside: I'll miss Thursday's Market. The upside: as we leave Richland, I hope to check out their farmers market, The Market at the Parkway. But since, for most Western Washington folk, a couple days in the 80s are enough to provoke whining and rain dances, I leave you with a few beat-the-heat tips, Market-style. Tip #2: Treat yourself to an apple granita (slushy) at Rockridge or a mojito-like lemonade at Crepes on Thursdays or a fresh-blended fruit-and-veggie concoction at The Juice Box on Saturday. Tip #3: Stay out of the kitchen and fire up the grill. A couple days ago we grilled rib-eye steak from Skagit River Ranch that had been soaked in a little lime juice and rubbed with chili powder, cumin, garlic, salt, and pepper. Alongside the steak we grilled Market sweet onions and red and green bell pepper strips. Then we served it up as fajitas, on homemade tortillas (not that hard to make) and topped with sour cream and the awesome fresh Green salsa from Saturday's Seattle Salsa Guy. Or, Tip #4: Don't cook at all! Come down and grab a pizza or tamales or crepes or hum baos. Soup or a burger. Chase your main course with a slice of pie or the last cherries of the season, an apricot or two. Whatever you do, come hungry! Stay cool, fellow food lovers. So, like many Americans, I've been glued to the couch, subjected to whatever NBC chooses to show me of the 2012 Summer Olympics, whether that be interviews with John McEnroe (huh?) or Ryan Seacrest (seriously--what??? ), gymnastics at 10:30 p.m., or a replay of the swim final I already watched hours before on the live stream. By the time they aired the Men's 4x100 Freestyle Relay, I had begun to hope that maybe I only dreamed the crushing livestream version, where France's anchor ate Ryan Lochte for lunch. Alas. France's Olympics aren't going too shabbily. As of this morning, they have 9 total medals to the U.S.'s 18, and a greater proportion of theirs (44.4%) are Gold, to our 33%. Their secret? I mean, besides hard, hard work and carefully-cultivated natural talent? Lately I'm thinking it's the food. I recently finished a fascinating read by Karen Le Billon, French Kids Eat Everything. The title says it all, really, and when I had finished her account of her family's year in France, where they were all indoctrinated into the French culture of food, I was convinced. Dang it! Why did my kids turn up their noses at odd vegetables--all right, at even many common vegetables--beg for snacks all afternoon, and make faces when I presented something new at the table? No more. I was going to introduce more variety in our diet, limit the snacking, and, when the inevitable chorus of "What is that? Ewww!" went up, I was going to go with the French response: "Try it. If you don't like it this time, you will after you've had it a few times." I might even throw in a "you don't wanna swim like Ryan Lochte, do you? You wanna swim like Yannick Agnel. To swim like Yannick Agnel, you must eat everything, like Agnel does." because Wade at Rockridge had urged me to try it out and give feedback. He's told me twice what "shiso" is, and I've remembered it zero times. Some kind of Japanese herb. In any case, the dressing tastes cucumber-y and very, very fresh. Our houseguests took seconds, if not my children. At the same meal we served grilled Market vegetables alongside: bell peppers, sweet onions, and teeny tiny baby potatoes I got at Alvarez. The main dish: Two If By Seafoods salmon glazed with olive oil and honey. Recently the Huffington Post ran a slideshow on some Olympian diets. Beach volleyball champ Misty May-Treanor likes Greek yogurt with honey, for instance. On Saturdays you can find Samish Bay's luscious Greek yogurt. Swirl in a spoonful of Cascade Natural Honey and a handful of granola or almonds, and you're set. Just about all the athletes ate a variety of vegetables and steered clear of processed foods. For those who needed to carb load before a big event, sandwiches hit the spot. And you know you can put whatever you want in the middle--it's the bread that makes the sandwich, and we have such tasty ones both Thursdays and Saturdays. The athletes would love our Market. One final reason to hit the Market this week: some theorize all those fruits and veggies and whole grains relieve depression. The jury may still be out, but it certainly might impact minor bummed-out feelings, like seeing your relay get trounced or looking at all those Olympian bods and trying to calculate how many calories you've (not) burned, prone, on the couch. Local honey. Imagine my thrilledness when I hit the Market last Thursday and found both Rockridge Orchard's Orchard Blossom Honey and Cascade Natural Honey's Blueberry Honey! I got a jar of each. Wade of Rockridge claims he can taste just a touch of the Broad Leaf Maple in his Apple-Pear Blossom Honey, and I've already posted about the luscious delights of CNH's Blueberry variety. Wild Alaskan Salmon. Hit up Two If By Seafood (Thursday) or Loki Fish (Saturday) for the tastiest salmon this side of Seastar. We basted our last filet in olive oil and Market honey, seasoned with salt and pepper, and threw it on the grill. It was devoured. Northwest Berries. The first two blueberry pies are in the freezer, and I have orders to bring back another half-flat. The raspberries didn't even make it till dinner time. Clearly I didn't buy enough. Pastries from Little Prague Bakery. Did I mention my mother was visiting? Every time we left the house, she seemed to come back with bakery boxes, and the visit to the Market was no exception. We had some beautiful berry cake-looking bar (my nephew called dibs), a melt-in-your-mouth apple cinnamon creation, and an apricot one that disappeared by the second time I looked in the box. These, in addition to granitas from Rockridge, scoops from Molly Moon's and a box of Dark Chocolate toffee from Pete's Perfect Butter Toffee. Yikes. That exploding sound is just my family blowing up after so many sweets. Compile your own list of Can't-Miss Items at this week's Markets! Maybe we could send Ichiro a care package. He'll need it, with those Yankees fans. 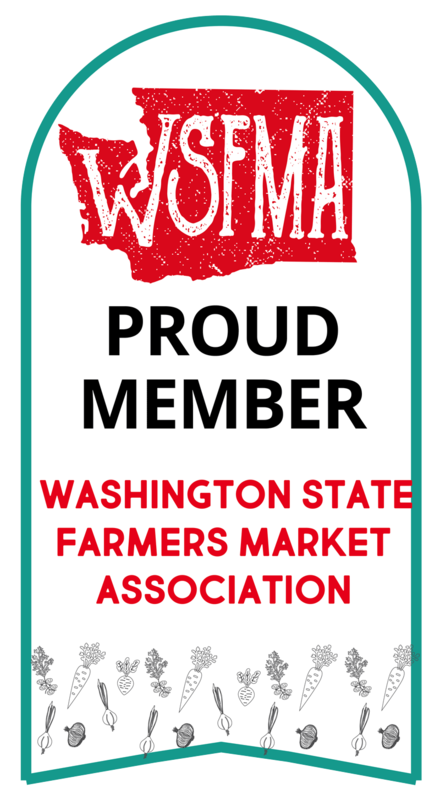 We had friends in town the past several days, and while my part-time job chauffeuring my three children hither and yon prevented me going into full-time tour guide mode, I did manage to get them to the Thursday Bellevue Farmers Market. Big, big hit. Big, and perfect for slicing! Doug and Kim had already sampled Rockridge Orchards' luscious Quarry Stone Hard Apple Cider at our house the night before, so we bought another bottle of it, along with some of the Skipping Stone Berry Cider and Tayberry Wine. Haven't opened the Tayberry yet, but the two hard ciders went over well, with Quarry Stone still my favorite. I've already promised to bring it to a 4th of July barbecue. Seriously, you have to try it. Just be sure to leave me a bottle. Tastewise I'm not a beer fan, so the Quarry Stone leans to the fruity, rather than the dry ale side. It was absolutely perfect with the Skagit River Ranch burgers we grilled up on Saturday, topped with Market lettuce and a Kittitas Valley Greenhouse tomato. For those who prefer drier hard ciders, Wade Bennett has those as well. I fully intended to try something new at The Box, but my kids demanded another Kahlua Pork Hom Bao and made such loud mm-mm sounds eating it that Doug got one, too. Thank you, Chef Reis. The branching-out will have to happen next week (or when I don't have the kids). Please keep that mini bagel burger around another week! Our friends' youngest daughter was recently diagnosed with a gluten allergy, so Kim eyed the gluten-free offerings at Manini's with interest. Scientific American reported this week that children who grow up in urban settings are more likely to develop food allergies than those raised in rural areas(!). Since nowadays our kids largely eat the same Big-Ag food, whether they're country mice or city mice, researchers are still theorizing as to cause. Do rural kids have better immune systems because they're around more dirt? Are city kids exposed to more pollutants? The jury's still out, but--hey--if your suburban kids need a gluten-free muffin, Manini's can set them up. And finally, while a swim meet prevented me from making the Saturday Market last week, I do have a tidbit on it from the week before. Please welcome Millingwood of Lake Stevens! Dave Mills has a flock of 335 chickens, roaming freely on five acres and producing 130 dozen of the tastiest eggs per week. Such natural, organic egg goodness went into my daughter's homemade Red Velvet birthday cake, and I like to think those two eggs offset the whole bottle of chemical food coloring I dumped in next. Yikes. See you all Thursday! Don't be surprised if I stop you and ask how you plan to cook some of the goodies in your shopping bags. Hip hip hooray--the Thursday Bellevue Farmers Market opens in just over three weeks!  Hope you've already marked your calendar for May 10, 3-7 p.m., in First Presbyterian Church of Bellevue's parking lot (last year's location). Opening Day is certainly on mine--in ink and highlighted. Welcome back to Rockridge Orchards! My mouth waters, just thinking about one of their cold apple ciders on a hot summer day. Their web page highlights ciders, vinegars, produce, wine, and honey, so I can't wait to see what they bring. I'll definitely have more on the blog about them when we open. Snohomish Pie Company joins us Thursdays! Not to be confused with the luscious Snohomish Bakery (who, thank heaven, will be returning on Saturdays), the Snohomish Pie Company specializes in--you guessed it--pies. All I can say is, those folks in Snohomish really do know a thing or two about baking. Millingwood Organics of Lake Stevens will bring eggs on Saturdays, to the relief of us marketgoers who arrive too late on Thursdays! More news to follow, as we get closer! Last week I visited the in-laws in Richland, Washington, and was thrilled to see this article in their Tri-City Herald about Washington asparagus farmers.The very first Washington asparagus is being harvested as we speak, people! The paper reports about 100 asparagus growers in our state, with 70% of them in Benton and Franklin Counties (where Richland and my in-laws can be found). The article's worth a read. As a non-farmer, I had no idea that asparagus is the most labor-intensive crop to harvest. It must be done by hand, as the worker with a pack strapped on him stoops over to whack each stalk with a knife. (My father-in-law confirmed this, having grown up in Dayton, Washington, which used to be Ground Zero for Green Giant Asparagus.) Not only is the work hard, but the same field can be cut up to 65 times in a season! Bring it on, I say. Love the stuff. Happy 2nd half of April to you all.